The medlar tree produced really well this year. I also, for the first time, actually got round to picking the fruit. If truth be told, I picked some so I could take a bag to my friends George and Tina. I know they will make jelly with them, this of course means I must make jelly with mine – this growing food business is very competitive! So I late last Saturday I went out and picked the rest of the medlars. It was getting dark so the photos I took are rubbish – sorry. 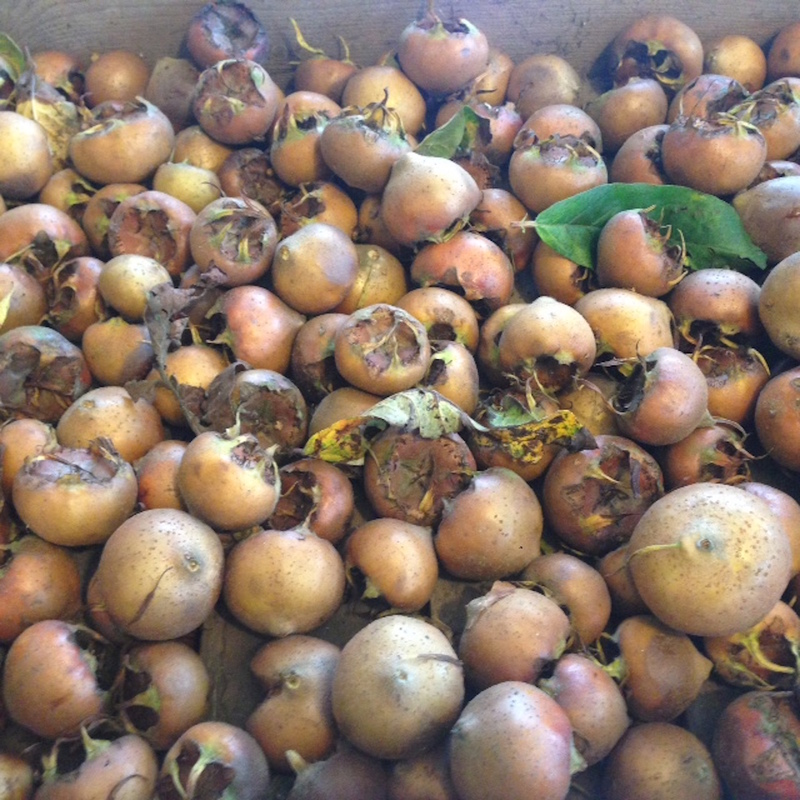 Some of the medlars had started to blet on the tree – blet is a fancy word for to go rotten. This is OK – you need to let them blet – you can’t use them until they have gone rotten. 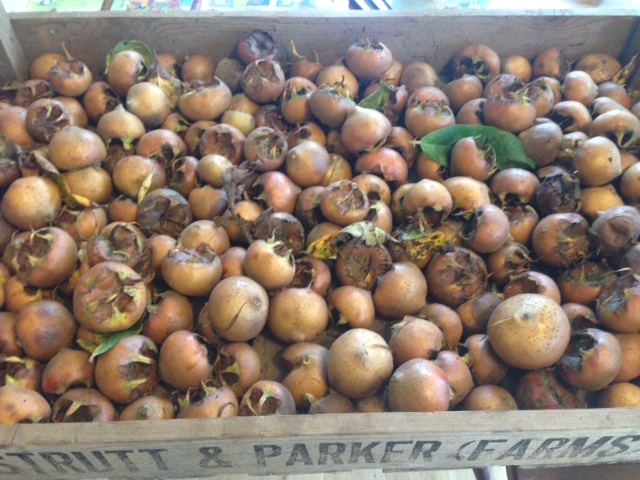 I have piled up the medlars in trays and left them in various places around the house slowly going rotten. It is so my kind of fruit. 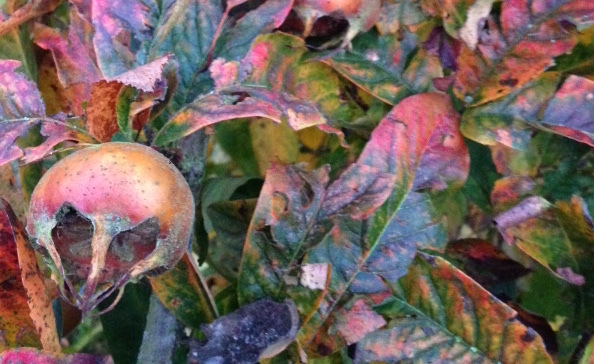 I told Mike and Cath about the medlars and they quoted Chaucer at me – I love medievalists. I learnt that medlars were called “open-ers” in Chaucer’s time and that old men, like medlars, cannot be ripe until they are rotten – til we be roten kan we nat be rype [The Reeve’s Prologue 21] ??. Medlars are still now sometimes called cat’s arse …. I am saying nothing. 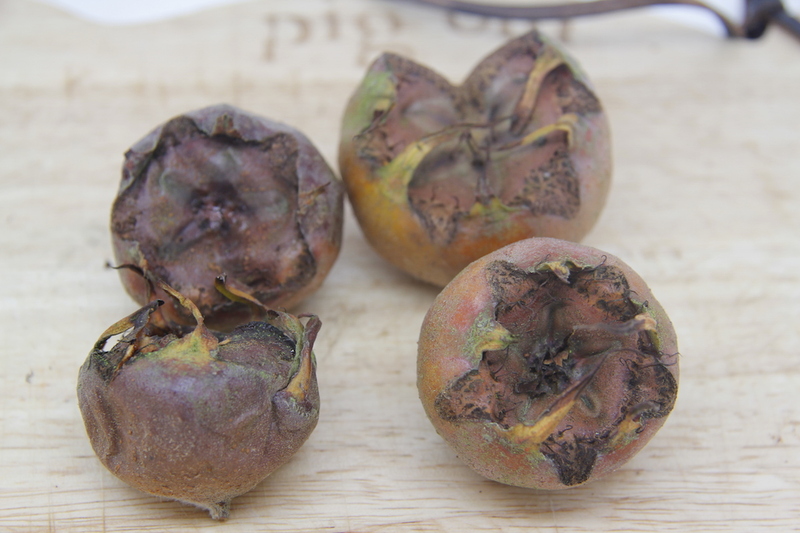 This weekend I am making medlar jelly and maybe medlar cheese. Its better to sometimes stay silent!! I don’t know which to be more excited about piglets or medlars? Thinking about both here. But for us we’re probably a way off piglets for a while. Looking at getting a few more fruit and nut trees for the Orchard and have been reading about medlars. Are they hard to grow? Will you post about how you get on with jelly and cheese? Thanks! Medlars are easy-peasy to grow. I planted the tree and have left it alone since. They are also beautiful trees with lovely white flowers. Our ducks like to hang out underneath it. Will definnitely post about the jelly and cheese! Great! I like things you plant then ignore!